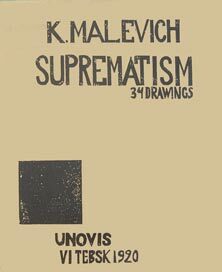 A facsimile edition of Kazimir Malevich, SUPREMATISM 34 Drawings, was published in 1990 by Artists . Bookworks accompanied by an introduction to the drawings by Patricia Railing; it is now out-of-print. This 2014 reprint of Malevich’s little book contains a new translation from the Russian and a new introductory text by Patricia Railing, “Reading the 34 Drawings”. The Russian text and plates were scanned from an original copy and the size of this little book conforms to the lithographed Russian edition of 1920. 80 pp; many mono illus. Reviewed by John G. Hatch (University of Western Ontario) in Languages of design, 1995: ‘Railing’s handbook [accompanying the beautiful reprint of Malevich’s Suprematism . 34 Drawings] is one of the better short monographs on Suprematism…. One of the particular strengths of this book is its examination of the paintings in the context of the theoretical writings.’ Other reviews: Peter Stupples,New Zealand Slavonic Journal, 1991, David Geary, The Structurist, University of Saskatchewan, No. 31/32, 1991/92, et.al.